And you are brought to safety in the calm harbor. Georgian monks began to settle on Mount Athos in the middle of the 10th century, and a Georgian monastery, Iveron, was founded there not long after. During the reign of Emperor Michael VIII Palaiologos (1259-1282), a union took place between the Orthodox and the Latins at the Second Council of Lyons in 1274 to mutually combat enemies. The Emperor replaced Joseph with John Bekkos as Ecumenical Patriarch (1275-1282) to promote the union. Among those who did not accept the union were certain monastics of Mount Athos. Crusader soldiers were therefore dispatched to Mount Athos to ensure they accept the union or face dire consequences. Many monks of Mount Athos still refused to accept the Union of Lyons, so the Crusaders had many of them tortured and killed. 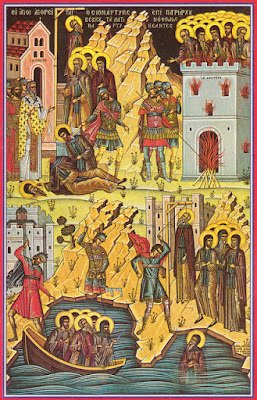 Among the well-known martyrs of this time are the 26 Martyrs of Zographou, Saint Kosmas the Protos, and monks from Vatopaidi Monastery, among others. The Crusaders demanded that the Iveron monks also accept the terms of the union and acknowledge the primacy of the Latin Pope. But the monks condemned their fallacies and anathematized the doctrine of the Catholics. 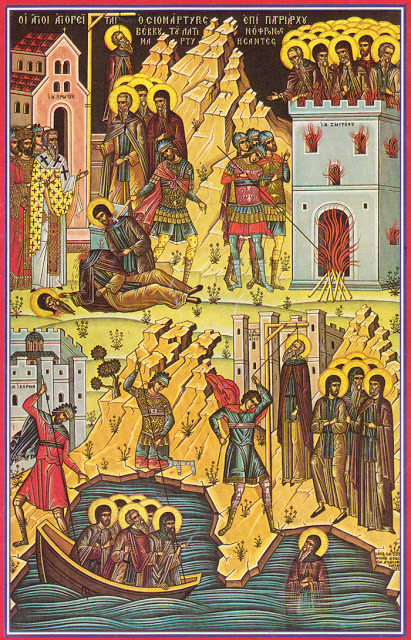 According to the Athonite Paterikon, the Iveron monks were forcibly expelled from their monastery. Nearly two hundred elderly monks were goaded like animals onto a ship that was subsequently sunk in the depths of the sea. The younger, healthier monks were deported to Italy and sold as slaves to the Jews. Some sources claim that the Georgian monks of the Holy Mountain were subject to the Latin persecutions over the course of four years, from 1276 to 1280.